The holidays are all about rushing wildly about, searching for that one present you know the special person in your life is just dying to have. This fact has never been more evident than during the current contracted version of the NBA’s pre-season. Have you ever loved something so much you just wanted to squeeze it to death? Well, that’s kind of what’s going on with the NBA this year. The powers that be, namely the owners, players, and Vladimer Putin David Stern, (no, not that David Stern, the other one) have decided that they just love the NBA so much that they’re going to squeeze in 66 games, a preseason, and an All-Star Game until either Kevin Garnett’s knees turn into coal dust or Mark Cuban decides to just buy the whole NBA. Over the past few weeks, The Lakers, Clippers, Hornets, Magic, Rockets, Knicks, Pacers, Nuggets, and TWolves have all been involved in significant deals. (Really!?! Since when does signing JJ Barea and Gawen DeAngelo, excuse me, “Bonzi” Wells count as a significant deal?) (Since I moved to Minnesota. So there!). Now I love the NBA. I mean I really, really love the NBA. Just ask my wife, who often, after watching me spend the evening shouting expletives at my T.V., has to gently remind me, “You do know, they can’t hear you, right.” My love for the NBA, however, has less to do with passionately supporting a specific team or player than does with supporting the idea of professional basketball. In other words, I’m all about the entertainment. This holiday season my idea of the perfect present is finding you the right team to put your support behind. Players come and go. So do coaches. Even franchises. (Just ask Charlotte, Vancouver or Seattle). But the basketball remains the same. So I say to you: Give up your loyalty. Stop rooting for your hometown squad. And let me pick your 2012 Western Conference NBA team (This year’s East = The “Wool Socks for Christmas” Conference) to follow. The Thunder is the team everyone who loves basketball loves to love. They have one of the NBA’s best loved young stars in Kevin Durant, a budding superstar in Russell Westbrook, a center (Serge Ibaka) who hails from the Republic of Congo, a guard with the best beard in the NBA, and a leprechaun of a coach who in his playing days used to look like this. Last season they made it to the cusp of the NBA immortality, losing to the Mavericks in Western Conference finals. By all accounts, they seem primed to take advantage. 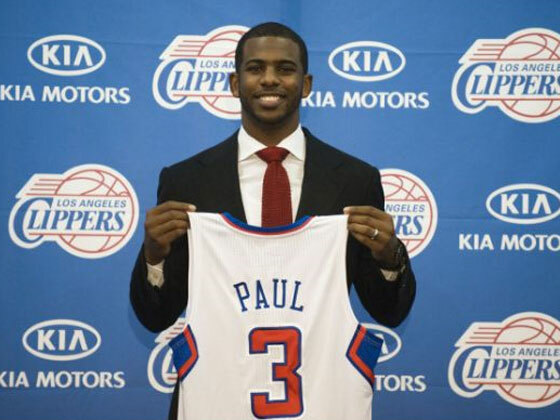 However being an NBA fan in 2012 isn’t about rooting for a predictable team filled with charming super stars. No, the Thunder are a far too obvious “present.” Akin to giving your gal that necklace she’s been hinting at for the past three weeks. Fearful Prediction: The Thunder, with its plethora of young, healthy players, skips merrily through the regular season, before losing once again in the Western Conference finals. With Blake Griffin’s posterizing ability and Chris Paul’s adept running of the point, Los Lobos seemed primed to have their best season in franchise history. However, beware loyal NBA fans the danger of jumping on a crowded bandwagon. The Clippers roster scares me. Chris Paul is just two seasons removed from major arthroscopic surgery on his left knee, every time I watch Blake Griffin play I worry that he’s going to break his face, and it’s hard for me to get too excited about Mr. Chauncey ‘Lame Shot’ Billups, Eric Bledsoe, Caron Butler, or DeAndre Jordan. Fearful Prediction: The Clippers make the playoffs, but lose in the first round when Chris Paul re-injures his left knee, followed by everyone agreeing I’m kind of a jerk for predicting it. The Minneapolis Lakers (Yeah, that’s right, I’m taking the name back, ‘Timberwolves’ is just stupid, and how many lakes are there really in Los Angeles? Not 11,842 that’s for sure). Okay, call me a hypocrite and a homer, but just look at their potential starting line-up: Ricky Rubio, Jose Barea, Michael Beasley, Kevin Love and Darko Milicic. Even by his standards, David “KAHN!! !” Kahn has assembled a veritable madhouse of players, which only grows nuttier when you look at their bench, which includes Nikola Pekovic, Anthony Randolph, Brad Miller, and Bonzi Wells. Poor Ricky Rubio and Derrick Williams will either end up in prison or in the nuthouse. Either way, it should make for good watching. 3) “Citing need for a fifth-string point guard, David Kahn signs Stephon Marbury to a ten-day contract. Fearful Prediction: The Minneapolis Lakers eke out an 8 seed in the NBA playoffs by outrunning all the old teams in the West. Then the OKC Thunder blow them out in four games. Or they’ll be their normal terrible selves and Michael Beasley will kill a ref just to watch him die. Either way: You should watch!